There are a couple of examples* where homes have encroached upon an outdoor range, BUT note that the range was pre-existing and people took advantage of lower property values to live near a range. It was their choice to live with the safety and noise concerns. It wasn’t forced upon them. Our first look at the applicant’s claim that property values would not be affected by their proposed outdoor gun range was published on this blog earlier this month. The Planning Commission’s public hearing for this outdoor shooting range is now over and we heard from the applicant’s realtor from Orange County. She read aloud the definitions of the four essential elements of real estate values – demand, utility, scarcity, and transferability (D.U.S.T). She said the value of real estate depended on those four things. For real estate to be valuable, it must be in demand. Demand is first on that list because it trumps all others and must be present. All other things being equal, would there be “demand” for a home near an outdoor gun range? We submit, and feel free to use your common sense here, that the demand for such a home would be very low and the vast majority of buyers would look elsewhere unless the selling price was well below market value. We actually have a good example of this right now in our neighborhood adjacent to the proposed site. This home has been on the market for months and potential buyers are turning away by the mere threat of a gun range being built. The realtor also stated that, “the property assessment and tax rate are established to meet the budget set forth by the county”. Is the assessment and the tax rate established together to meet the budget? Or is the assessment made independently by the assessor followed by establishing a tax rate to meet the budget? The latter is true, so lower assessments mean higher tax rates if you want to get the same total tax money for things like schools. For residential properties, the Assessor must determine actual market value. This is based on style, size, amenities, location, and other property characteristics, which is then compared to similar properties that have sold during the sales study period. The realtor continued with, “market conditions drive assessment values, not the actions of neighboring properties”. Remember that demand is a part of market conditions and demand for property adjacent to an undesirable facility will not be high. There’s a fairly well known academic paper published in Ecological Economics (1998) by Stephen Farber titled, “Undesirable facilities and property values: a summary of empirical studies” that states otherwise. We think an outdoor gun range certainly fits in the category of undesirable facilities. The realtor then went on to describe how two Orange County ranges and properties nearby were comparable to this Greene County proposal. She only stated the total numbers of homes within 2 miles for both of the ranges, because those numbers fit their argument, knowing full well there was a significant difference within 1/2 mile – 160 homes vs 2-3. We like to emphasize the 1/2 mile because even the NRA states there will be noise issues within that distance. Once again, this is the first gun range example they used: the Piedmont Sportsman’s Club (PSC). Aerial photo from late Summer. We contacted the former president of the club and found that it opened in the 1970s at the current location (Est. 1969). You be the judge as to how it compares to the site that many in our neighborhood can see from their yards. The phrase “middle of nowhere” might come to mind with respect to the Orange County range. Meanwhile, a person can walk 10 minutes to the Super WalMart from the Greene County proposed location. Factor in also that the nature of the range is totally different. The PSC is a private club of limited members with restrictions to join, minimizing the risk and volume of noise. Not 20-lanes, open to the public from 10 to 8 every day, with off-the-street gun rentals or test-drives of guns. To use a realtor’s phrase: this is not a good comparable. What about the second one, the Orange County Sheriff’s gun range? This one’s just as curious, if not more. At first, we thought we were looking in the wrong place since this was the wilderness of Orange County and to compare it to their proposed site in Greene County with 160 homes, several school bus stops, and two churches within 1/2 mile and just 100 feet off US Rt 33 would be totally ludicrous. It turns out that they were seriously comparing the two. We thought we’d call the Orange County Sheriff’s office about their gun range, just to get some details. We spoke with Becky Jones, the Assistant Range Master. She was very nice and helpful. It turns out the range has been there at least 15 years and they basically use it on an as needed basis for various types of training. It’s nothing like the daily use a 20-lane public range that’s open 10 to 8 will get. Oh, and she said it was in a heavily wooded area without a home around. But Google Maps already told us that. Unless we heard her wrong, she called our information “flawed” in her presentation. Something about how one house we used as a comparable was actually 5 miles away from the range? In fact, all four home sales we used were within 1 mile of the PSC as the aerial photo below can attest. We love maps at wronglocation.org, so we were surprised to hear her once again repeat her statement of there being an entire neighborhood “feet away” from the PSC in Orange. We can’t find them. Perhaps she’s using terminology like “neighborhood” and “feet” loosely once again. There are some homes just outside the gated entrance to the 251 acre PSC, but they are 3/4 mile away from the actual shooting site and they came well after the PSC opened. We suspect these are the ones she’s referring to. We sent her an email hoping to clarify some of these things. We hope to hear back. We still have not and it’s been months. We’ve always said that you can’t compare potential loss of property value in a community where homes were built after a gun range was opened. The home values began depressed, since the range is already there. There are no before and after figures available to compare. But she stated in the public hearing that she did use before-after values in her analysis. Let’s review her 5 examples…. …where she states it proves her point that Orange County property values were not affected by their gun ranges. Let’s ignore the fact that these ranges are well hidden within thick trees and buffered by terrain. Let’s ignore the fact that the ranges have restricted hours and memberships and are nowhere like the 20-lane, open 10-8 outdoor range that we’re fighting against. 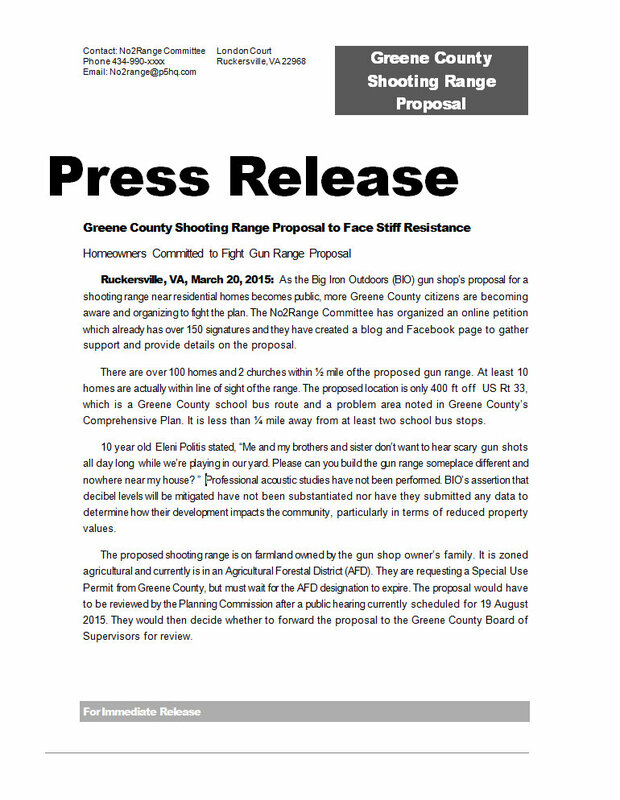 Let’s ignore the fact that these examples are at or over 1/2 mile from a gun ranges, while the Greene County proposal has 160 homes within 1/2 mile. Let’s ignore all those important facts and see how these pan out. We’re using her sales history figures and some more recent, updated sales from zillow.com. FLAW: Gun range was present well before 2013. It opened in its present location during the 1970s. FLAW: According to the Assistant Range Master, it’s been in use since at least/before 2000. The fact remains that this is a sheriff’s office range that gets a small is half the size of a 20-lane, open 10 to 8 public range. Oh, and it’s heavily wooded and the terrain around it is spectacular for a gun range – bowl-shaped and very concealed. FLAW: Don’t even know what to say to this one. First, this property is quite a distance from both gun ranges, and second, both gun ranges were present before 2003. It’s a head scratcher. FLAW: The PSC was present well before 2004. FLAW: Again grasping at straws here by going out over 2 miles to find a property. But not sure why. This is a farm with 212 acres and a 3 bedroom home on it. Bottom line is that the PSC was present well before 2004. And there’s also her example of the Wolftrap Farm B&B. Again, we’re not sure how a place that’s 1.47 miles away from the PSC and specializes in weddings and events is in any way equivalent to a family living in a home adjacent to a 20-lane outdoor gun range. I’d also be willing to wager that this B&B gets business from the PSC – sportsmen spending weekends to shoot there. This realtor simply gave bad information in a public hearing to the Planning Commission on a very important issue that affects peoples lives – safety, quality of life, investments, childrens’ futures. To be blunt, she spoke in favor of something that can ruin peoples’ lives. We sincerely hope she writes to the county and corrects some of these statements. The gun range applicant evidently seems to think that the support of his adjoining neighbors is important. That does, in fact, make total sense! He made a point to mention that seven adjoining property owners supported a range at that location in the recent NBC29 report. And there are several documents in their package submitted to the Planning Commission that highlight the adjoining neighbors’ support. Many more adjoining property owners are vehemently opposed to the range. We count at least 15. Perhaps we should thank the applicant for pointing out the importance of neighboring support. Why does he dwell on the seven? Not sure. I suppose he doesn’t think people will point out that the other 15 want no part of an outdoor gun range next door. Or maybe his seven are long-time neighbors/friends and more important to him than those of us who have been here 10 years or less? Do our property rights matter less? We must also note that the seven who the applicant mentions or others who have not committed may be long-time neighbors who do not necessarily want a range there; People that may oppose the range but don’t want to come out publicly and ruffle the feathers of a longtime resident of the area. They may be pressured due to business relationships or loose friendships to not join the opposition to this location. Regardless of the reason, it’s just not right to tout adjoining neighbor support when the vast majority of them are opposed to this proposal, as written. Please. This is causing too much stress with the neighbors and the surrounding community. Let’s work together to find a better location.